DURING the welcome Mass for Cardinal John Ribat late last year, many people spoke kindly of the shepherd who was now the first cardinal to be appointed from Papua New Guinea. He spoke of the humility Cardinal Ribat expressed when told of his appointment. “Nuncio, I never expected this, not even dreamt of it,” Cardinal Ribat had said to Archbishop Vayalunkal. “If it is the will of God I accept it and I know God will give me the grace to fulfil my duty. “Cardinal John Ribat, such a simple and humble person, really he deserves this recognition from the Pope,” Archbishop Vayalunkal said. “It was a surprise to many, but it was not a surprise to me. Knowing Pope Francis I could understand it very well. “This appointment is a sign of Pope Francis’ love for this country and the people of Papua New Guinea. A delegation from Townsville was invited to attend the celebrations and Fr Mick Peters, from North Ward, spoke on behalf of diocesan administrator Fr Mick Lowcock and the people of Townsville. “It’s true we are all brothers and sisters, and Jesus is our brother and he is the light to the world, Cardinal John,” Fr Peters said. “You are a light to us and that light reaches right down to the Diocese of Townsville in Australia. Bereina Bishop Richus Tatamai spoke about Cardinal Ribat’s passion for all people in Papua New Guinea. “Cardinal Ribat has been just like those who have come before, a champion of togetherness and dialogue with everyone,” he said. “We have heard that we need to give thanks to the LMS (London Missionary Society) and Methodists who came before us, and the Catholic Church has been working together and partnering with other religions. “He understands that part of building relations is bringing people together, dispelling fear, seeing one another as brothers and sisters and that is the call that we have been hearing so far today. The PNG Council of Churches chairman Anglican Bishop Denny Guka was proud of the appointment of Cardinal Ribat. 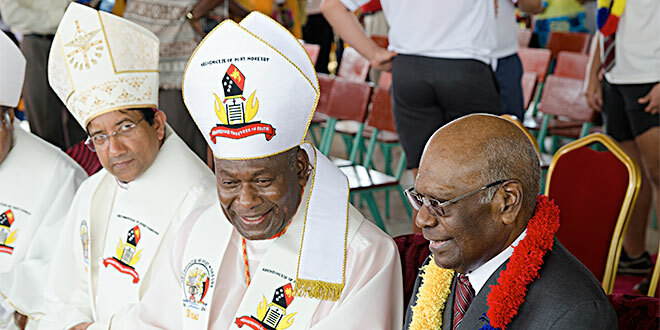 “On behalf of the PNG Council of Churches I want to congratulate Cardinal Ribat,” he said. “God has recognised one of those among us to show the world what God has been doing over 150 years since the missionaries arrived on the shores of PNG.